Our plan was to stop in Waisai for a day, buy diesel, and then head over to Sorong. When we got to town, it seemed overrun by various uniformed military personnel. The waterfront area, which doubles as a town square, was bustling with hammering, painting, tent-raising, and general clean-up. The whole area looked spiffy and new, compared to when we were there just two weeks previous. We approached a group of official looking people relaxing near the entrance. 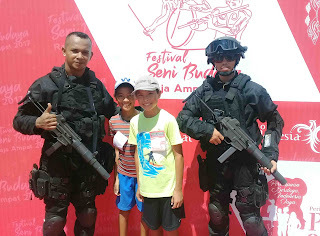 They turned out to be some Army guys and the mayor of Waisai (the king of 'Raja Ampat' as one guy joked). 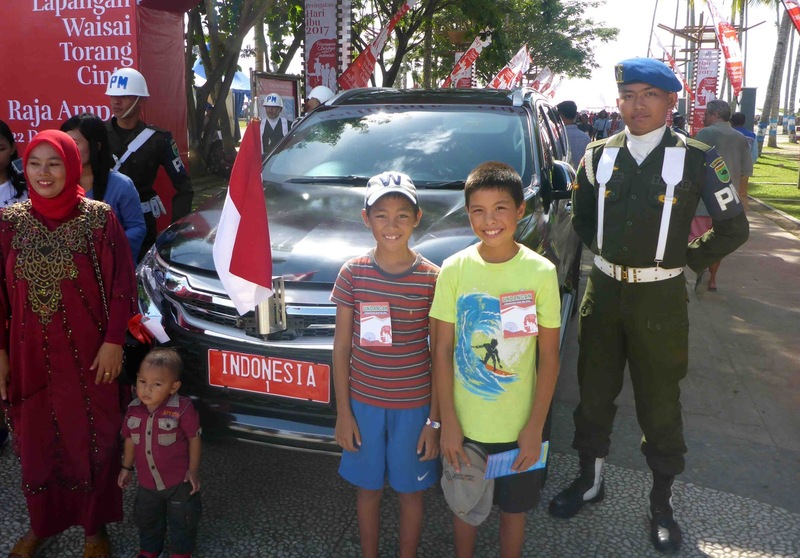 We found out that all the hubbub was in preparation for the Indonesian President's visit on Mother's Day. The mayor told us we should come. We chose to view it as a personal invitation from the mayor, rather than just an offhand comment to some goofy foreigners. So we stayed, of course. I mean, how often do you get to see the President of a country? On the morning of December 22 ('The Big Day'), microphone testing started at 6 a.m. (preceded by the call-to-prayer at 5 a.m.) 'Testing-one-two' sounds a lot more exotic in a different language. A couple of hours later, we were treated to front row seats as a boat parade, complete with drummers and dancers weaved through the anchorage. Then we headed in to join the festivities with Steve and Dinkie from Pikudiku. When we arrived, we found out that you needed a special badge to get in, which we didn't have. Eventually, after making nice-nice with one of the event organizers and mentioning 'We came all the way from Chicago' and 'The Mayor said we should come', we wrangled some passes. 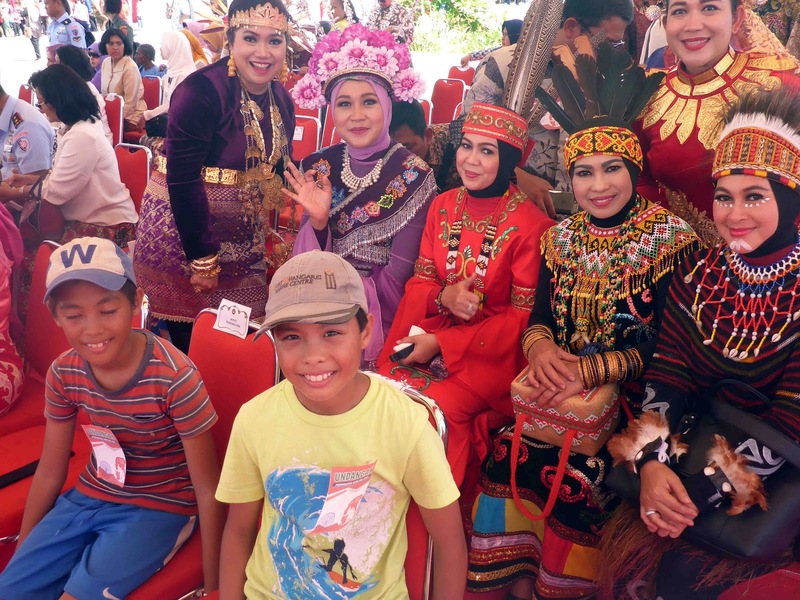 Before the President took the stage, he was entertained with cultural singing and dancing in elaborate costumes. 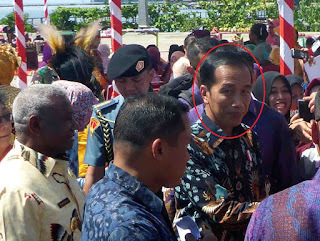 President Joko Widodo, especially in his official photo, resembles Barack Obama with maybe a little Mr. Sulu thrown in. He had the crowd roaring with laughter as he bantered and pretended to haggle with some local produce ladies that he had called up to the stage. I really wished that I knew more Indonesian so I could understand all the jokes. Seeing the crowd's reaction and speaking with some of the attendees, President Widodo seems to be much loved. 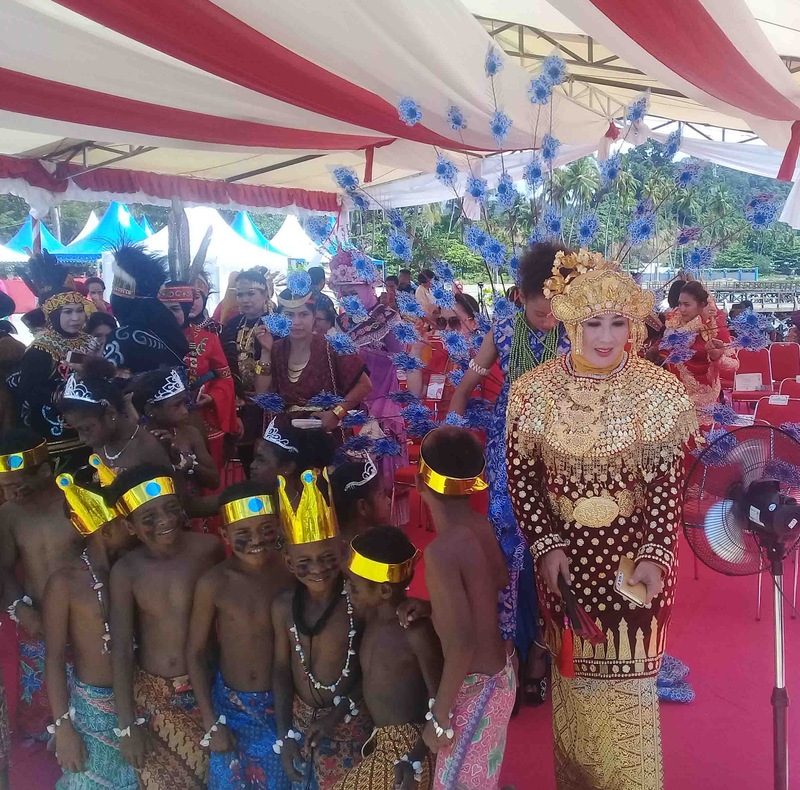 Afterwards, as he was being hustled off the stage, Matt followed all of the folks that rushed over and got to shake hands with President Widodo. 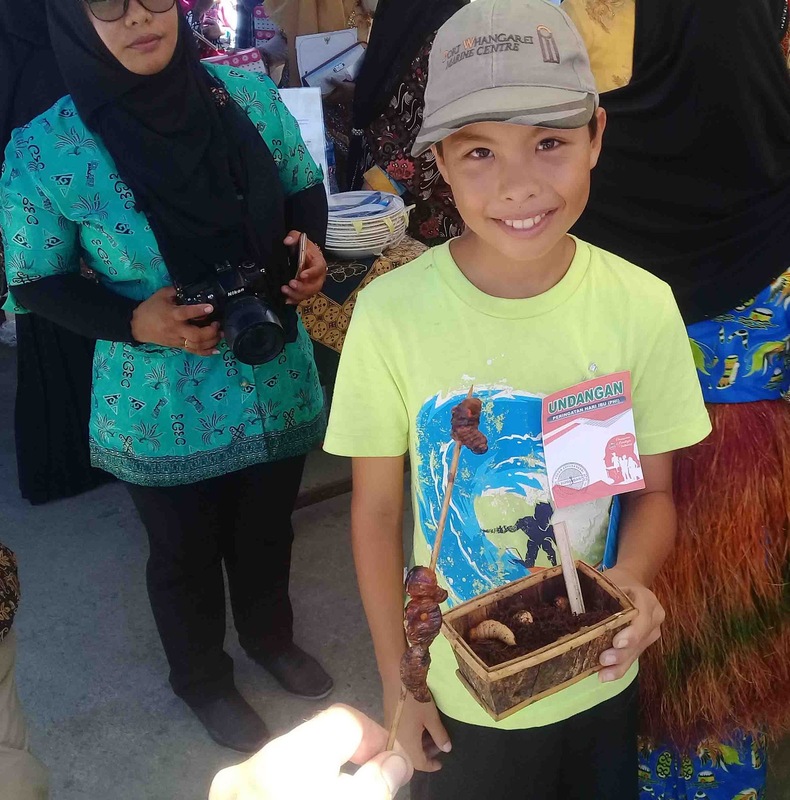 In another part of the event, various regions of the Western Province had booths set up with crafts and local foods. We even got to try roasted grubs (they tasted good but it was hard to get past the squishy interior and image of writhing live grubs in a nearby tub). We had some good conversations with local folks and people that had traveled from all over Indonesia to see the President. Everyone's mood was friendly and somewhat jubilant. It always seems like we miss the festivals in the places we visit, so we felt doubly fortunate to be able to be a part of (worm our way into?) this one. The fish boil after it had calmed down some. Sadly, no photos of the whale. Our trip to Sorong from Waisai was unusual in two respects. First, we were able to sail rather than motor. Almost all our other journeys within Indonesia have been motoring, usually with headwinds and adverse current. This time we had decent wind and the current was with us. Second, we were treated to a huge boil of baitfish, jumping tuna and slashing sharks with a mass of circling frigate birds and gulls. In the midst of it all was a big whale feeding. At one point it surfaced straight up into the boil and we could see its huge jaws agape, swallowing in fish. We couldn't identify it from its back and blow--it wasn't one we were familiar with. As we got closer, we could see dozens of big sharks swimming in the water. Conrad and Mark were extra careful not to fall in the water. We are spending Christmas at an anchorage not far from Sorong but away from the hustle and bustle of the 'big city'. Can definitely empathize your experience with the grubs. When we were in Peru I was the one elected to skewer those writhing soft white little devils before they bbq’d them over charcoal. Didn’t want to eat them but was shamed into it when Bob did the honors.